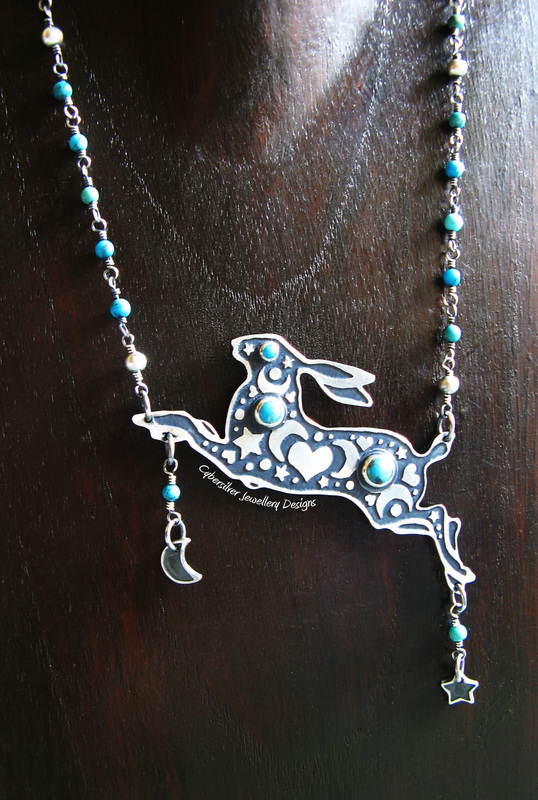 This magical leaping hare is entirely handmade by me - no casting or mass production is involved in her creation. 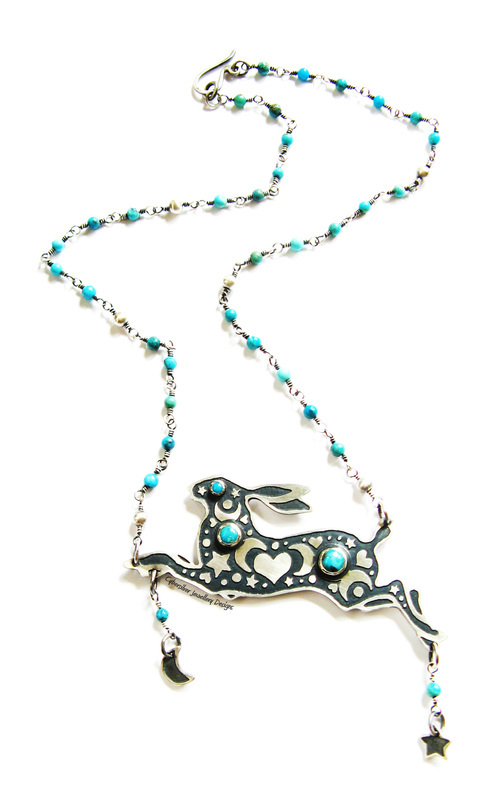 She is constructed from thick sterling silver and set with genuine turquoise gemstones. Her chain is entirely handmade by me and consists of genuine turquoise and sterling silver beads meticulously wire-wrapped by hand using 160 cm of solid silver wire. It is finished with a handmade silver clasp. The silver has been oxidised, brushed and sealed with a protective wax to emphasise the design and protect the oxidisation. Oxidisation is a surface treatment which can continue to lighten with wear. 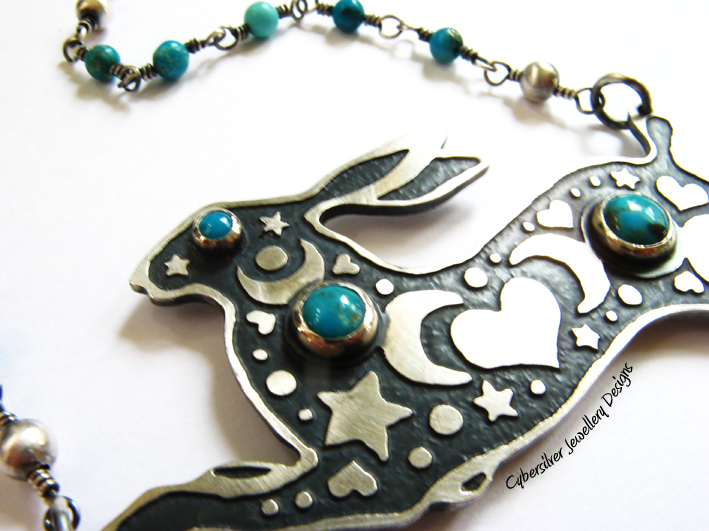 Size - approximately 80 x 30 mm (excluding the moon and star drops). If you would prefer a shorter chain length, please leave a note in ' Add special instructions to the seller' during checkout. To ensure you receive your pendant promptly and safely, I post tracked and insured. As soon as I post, I will message you with your unique tracking number. I charge only the actual postage costs. For thousands of years the world over, Turquoise has been prized as a beautiful and powerful gemstone. For the Ancient Egyptians, Persians, Aztecs and Incas, and Native North Americans, Turquoise was sacred and worn for the power, luck, and protection it was believed to provide. Turquoise is considered the stone of friendship and if given by a loving friend, the stone will protect the wearer from negative energy and bring good fortune. Turquoise is also a master healer and is believed to alleviate rheumatism, gout, stomach problems and viral infections and have anti-inflammatory and detoxifying effects. The stone empowers men and women equally and is a talisman of luck, success, ambition and creativity. Turquoise protects you and your possessions against theft, loss or attack, and helps prevent accidents, especially falls.